Roofware is a much-neglected part of our architectural heritage, but the roof is arguably the most important part of a building. It not only provides shelter from the elements and an outlet for smoke, but can also be decorated. 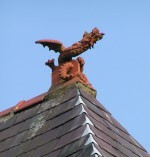 Roofs are not easily accessible, and so few people look consciously at rooftops, yet closer scrutiny can reveal a fascinating range of ceramic roof features and ornamentation. Roofs are made of many types of material such as thatch, stone, slate and wood, but roofing materials made from fired clay have proved particularly effective and durable. Firstly, and most important, there are clay roof and ridge tiles, which give buildings protection against rain and snow. 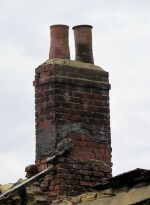 Secondly, for ventilation, there are brick chimneys and clay chimney pots that allow smoke and fumes to escape from wood, coal and gas fires. Thirdly there are all kinds of ceramic roof features like finials, turrets, vases, sculptures, domes and gables, which are not only aesthetic additions but they can also define the status, ownership and function of a building. The history of ceramic roofware goes back to the Greeks and the Romans who used terracotta tiles and roof ornament on their buildings for functional and decorative purposes. In medieval times the practice of using ceramic roof tiles was revived for palaces and monastic buildings and became more widespread in the fifteenth century when more houses were built using stone or brick. In the sixteenth century tall brick chimneys became a particular feature of the roofs of many large Tudor and Elizabethan manor houses. 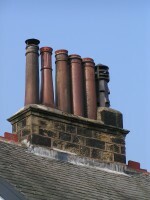 Chimney pots became common in the Georgian, Victorian and later periods when coal was used as fuel. Until the nineteenth century local potteries and tileries made their products by hand and served their local area. In the nineteenth century the use of machinery made mass production possible and big manufacturers came onto the scene who were able to meet a growing demand in Britain’s fast expanding cities and distribute their roofware nation-wide via the newly built railways. The hey-day of ceramic roofware in all its forms was the second half of the nineteenth and the early twentieth century. Few buildings great or small were without decorative ridge tiles, chimney pots or ornamental roofware, which also satisfied the Victorian and Edwardian love of decoration. After the First World War the use of roof ornament lessened because of new architectural tastes and fashions that extolled the virtues of simpler forms with little or no decoration. However plain chimney pots and roof tiles continued to be made for the growing number of middle class suburban homes in the 1920s and 30s. 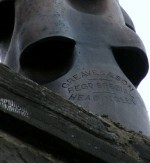 The use of chimneys and chimney pots declined sharply after the Second World War when other forms of heating than coal became more common and many manufacturers of roofware went out of business.